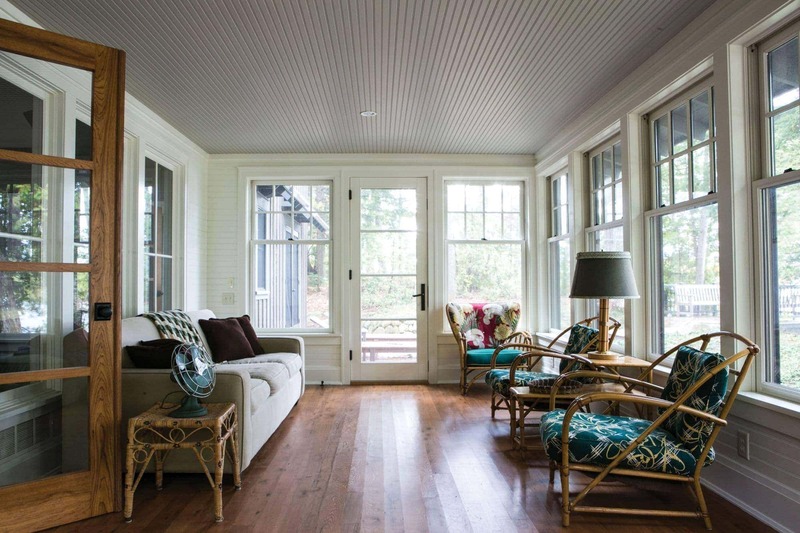 A family with deep roots on Long Lake builds a new cottage close to Traverse City that pays its respect to their former humble summer home. 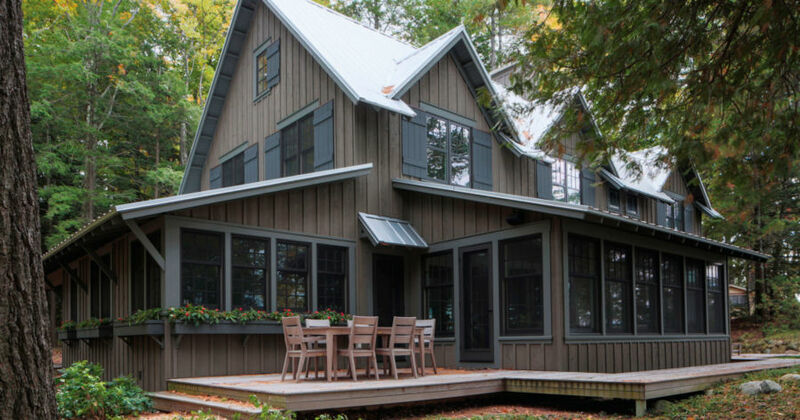 This home is featured in the June 2015 issue of Northern Home & Cottage, a bi-monthly home publication included in all subscriptions to Traverse, Northern Michigan’s Magazine. Subscribe. In 1937 a young woman purchased a small, rustic cottage on a woodsy lot on Long Lake—deep in the Northwoods back then. Given the era, it might have been considered a bit daring. But a college friend whose family cottage was next door had urged her on. Her decision proved a fabulous investment—in family life. 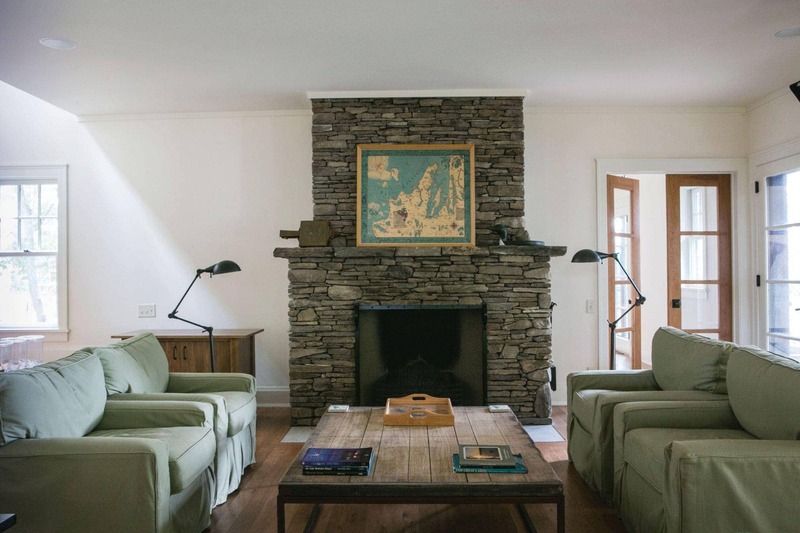 Every summer since, the property has drawn family members to the classic good life Up North: days spent boating, waterskiing, swimming and hiking capped off by cocktails and campfires on the shore. By the 1950s, members of the woman’s extended family had purchased an adjacent property to create a small family compound. Eventually, the original cottage, quaint and memory-filled as it was, fell short on capacity for the growing family and guests. The place had become the single gathering point for family members now scattered across the country, and as such, clearly needed an expansion and update—or, as it turned out, a fresh start from an architect with respect for the rich traditions of the property. The family discovered architect Robert Ben Begley after spotting one of his recent projects while cruising Long Lake. The new home stood out to them for its strong historic lines that blended well with the lake’s older vernacular architecture. They contacted Begley, who explored their site and talked at length with family members. The upshot of his research and discussion was the design for a five-bedroom cottage with a convincing old-house appeal. 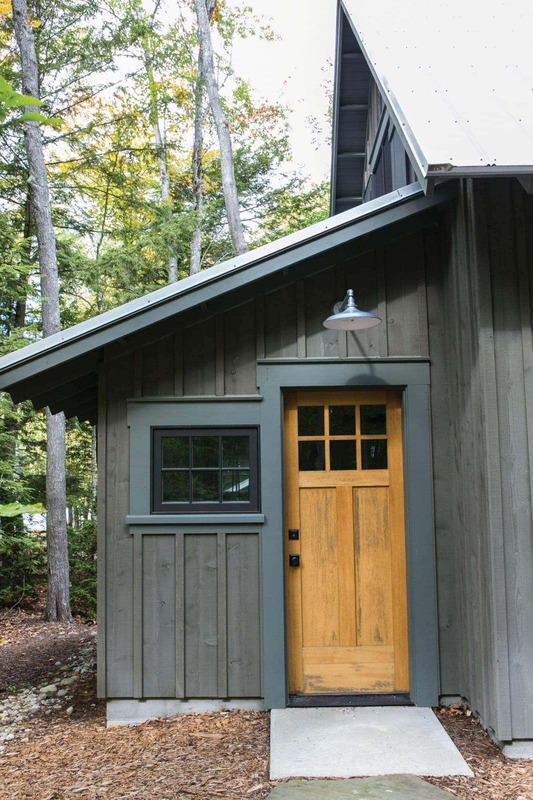 The exterior draws on the vernacular styles of 1930s lodges and camps with cedar board-and-batten siding, exposed rafter tails, functional shutters, aluminum roofing, and a paint palette of mossy greens with charcoal accents. Begley made the most of the pie-shaped lot by positioning the house and detached garage in such a way that all rooms except one bathroom have a lake view. A window-lined kitchen and a three-season porch on the lakeside flank the main floor living area, with its full masonry fireplace. Upstairs, the bedrooms and bathrooms are small by design to contribute to the vintage mood and to create privacy for many guests. A hallway, narrow by today’s standards, shows off exceptional attention to detail in the millwork design and craftsmanship. 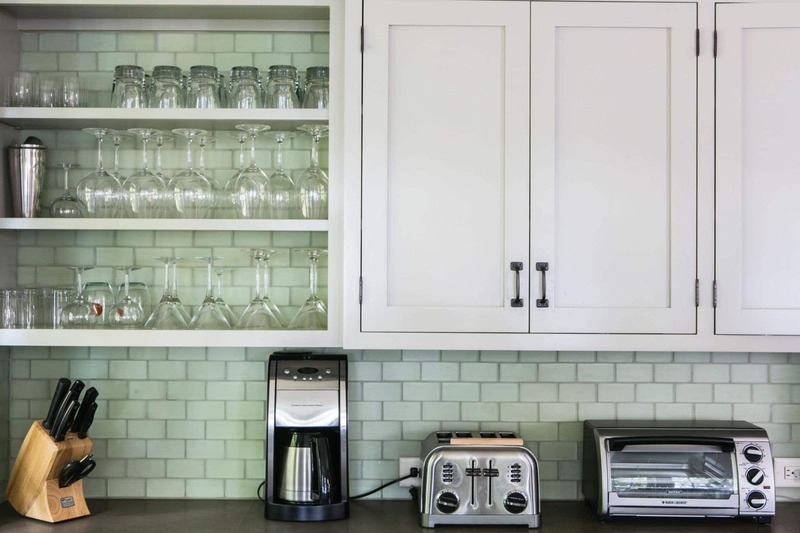 These aspects contribute to the home’s feeling of age and solidity, Begley explains. Well before attending to the details, however, Ferraro and his team adeptly managed the biggest construction challenges: easing heavy machinery down the narrow dirt lane—better suited to early autos than modern excavation equipment—while protecting the site’s mature trees. With most of its ancient hardwoods and hemlocks still standing tall, the property appears untouched—an element that ads to the setting’s timeless aura. As it was in the old cottage, outdoor living is a natural extension of the new home with its extensive decking and outdoor shower. The original bathhouse has been spruced-up, too, with a view deck—the perfect perch for the family to gather for their cherished tradition of evening cocktails. Today’s family matriarch, a niece of the original owner, spends all summer on Long Lake in her own little wing off the main-floor living space. Her memories of 12-hour hikes circumnavigating Long Lake’s shore and lively family dinners crammed into a tiny kitchen are as alive as the scenarios happening today with her grandchildren. 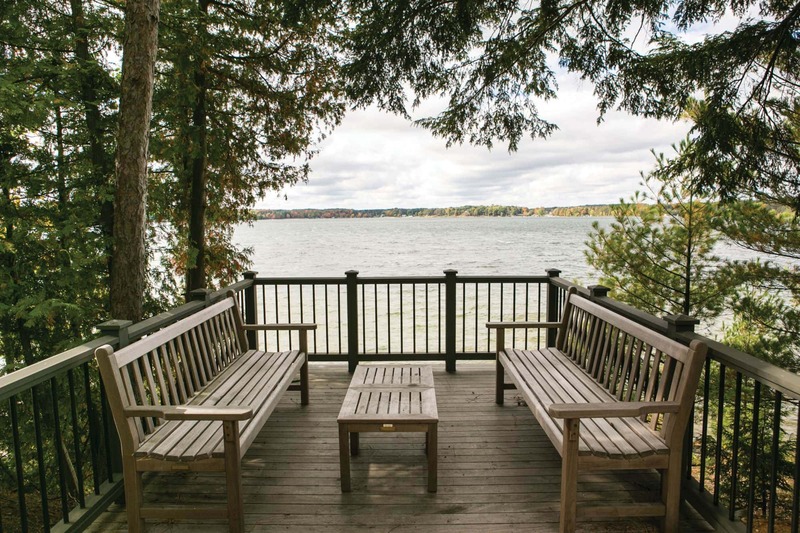 When the cottage eventually hosts a fifth generation, the family will always have their place to gather, to tell the stories and sense the spirit of their great-great-great aunt who was wise enough to buy a tiny cottage on Long Lake in 1937.